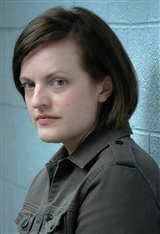 Elisabeth Moss was born in Los Angeles, California to musician parents. Surrounded by the glitz and glamour of the entertainment industry, Moss wanted to break into the business early and started the way many actors do—in commercials. At the age of eight, Moss landed her first real acting role in the television movie Bar Girls. Elisabeth spent most of her young career appearing in TV movies and guest stints on television shows. She appeared in the 1995 small screen remake, Escape to Witch Mountain, and played a teenage Ashley Judd in the movie Naomi and Wynonna: Love Can Build a Bridge that same year. In 1999, Elisabeth booked her first major role as the first daughter in the Aaron Sorkin television drama, The West Wing. She appeared on a recurring basis until 2006. That same year she earned a role in the critically acclaimed drama, Girl, Interrupted . While sporadically shooting the politically charged West Wing, Elisabeth also filmed a recurring role in the short-lived alien thriller, Invasion in 2005 before its ultimate cancellation. Two years later she would land her biggest role to date. In 2007, Elisabeth graced audiences with her breakout role in the AMC television phenomenon, Mad Men, a dark portrayal of Madison Avenue ad executives on which she played Peggy Olson, the meek secretary turned copywriter at Sterling Cooper Draper Pryce. Critics immediately took notice of Elisabeth’s commanding performance and she was nominated for the Outstanding Performance by a Lead Actress Emmy in 2009 and 2011. In 2008, while taping a guest appearance on Saturday Night Live (hosted by co-star Jon Hamm) Elisabeth met comedian Fred Armisen. The pair hit it off immediately and were married in 2009. Eight months later they announced their separation and in September 2010, Elisabeth filed for divorce citing "irreconcilable differences." While neither have commented on the reason behind their abrupt split, rumors suggest Armisen engaged in an affair with SNL co-star Abby Elliot, as the two went public with their relationship shortly after his divorce. In 2009, Elisabeth's film career took off when she shared the screen with Sarah Jessica Parker in the comedy Did You Hear About the Morgans? and in 2010 as the female lead in the Jonah Hill/Russell Brand buddy comedy, Get Him to the Greek . Elisabeth also played a supporting role in the Diane Keaton canine comedy, Darling Companion (2012) and played Galatea Dunkel in On the Road (2012), which premiered at Cannes. She went on to star in the British thriller High-Rise (2016), followed by a starring role in the critically acclaimed series The Handmaid's Tale, for which she won a Golden Globe award in 2018. She recently performed the role of Dahlia in the movie Us (2019). Elisabeth married comedic actor Fred Armisen in 2009, but the marriage ended in divorce less than two years later.